A section of the current play park in Linton. Residents in a Northumberland village have come together to work on a £150,000 project to transform its play park. As well as new facilities for the children, the Linton Colliery Community Group is also looking to install outdoor gym equipment for teenagers and adults at the site. The overall state of the park – located on Fifth Row near Linton Primary School – due to its age had been raised at council meetings and following an initial meeting in spring 2018, the group was formed in June. It has 12 members at the moment and many others support its fund-raising events. A total of £800, £400 at each, was brought in from the group’s summer fair and community Christmas celebration last year and £100 was collected from the stand it had at the Linton Village Hall Christmas Fair. In addition, £420 was raised from the rock and roll event in the village hall on Saturday, with 82 tickets sold. Advice has been sought from CELL (Cresswell, Ellington, Linton and Lynemouth) Big Local and a major funding application has been submitted to the scheme. Members have also received advice from Northumberland CVA. Linton Colliery Community Group chairman Heather Wallace said: “The play park has been in its current location for about 25 years and it’s a very dull park at the moment. “The only work that has been done in recent years is making sure the current equipment remains play-worthy and upgrading the ground sections underneath the equipment for safety reasons. 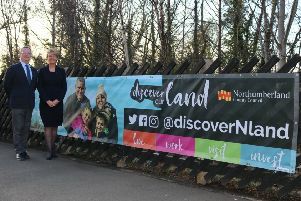 “We’re hoping to have everything in place in the next two to three years and when it is complete, it will be bold and bright and a fantastic asset for the village. “We’re grateful to our fellow residents for backing our events and the school’s headteacher, Sam Mason, and our local county councillor, Liz Dunn, are being very supportive of our efforts, as is Ellington and Linton Parish Council as we have an agreement to use more land next to the park to extend it and for the council to maintain the new equipment. Secretary Rachel Lavery is a parent governor at the primary school and she went into the school to ask pupils what they would like to be included. She said that the proposed equipment includes a mini play train, slide, swings, a climbing tower and a see-saw. The other project the group is looking at is to install a memorial, such as a mining tub, as a permanent reminder that Linton is a former colliery village.